Quick overview Written by the leading name in the field, this is an engaging introduction to the main concepts in both quantitative and qualitative research methods in sport, exercise, kinesiology and health. Conversational in tone yet thoroughly comprehensive. This book systematically demonstrates the significance and application of method in plain language. 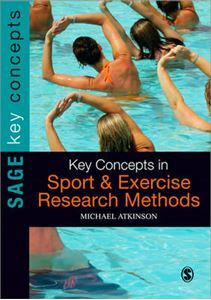 Written for students it contains the core methodological concepts, practices and debates they need to understand and apply research methods within the field of sport and exercise. The book provides a comprehensive panoramic introduction which will reassure and empower its readers. Written by a leading academic, and drawing on years of teaching experience, it includes carefully cross-referenced entries which critically engage with interdisciplinary themes and data. Each concept includes: * clear definitions * suggestions for further reading * comprehensive examples * practical applications Pragmatic, lucid and concise the book will provide essential support to students in sport and exercise science, kinesiology and health.